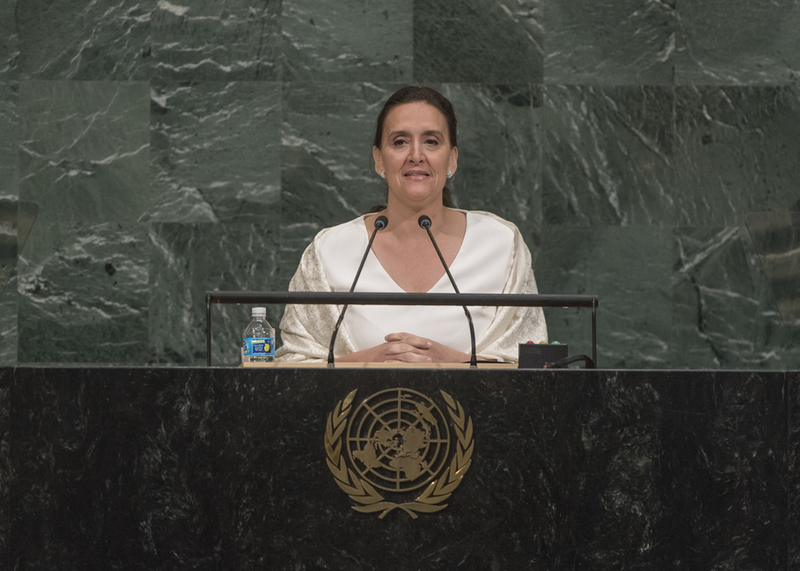 MARTA GABRIELA MICHETTI ILLIA, Vice-President of Argentina, voiced solidarity with the people of Mexico following its recent earthquake, stressing: “The environment and the forces of nature are speaking to us.” Her country was moving towards zero poverty and had just presented its first voluntary national review of the implementation of the 2030 Agenda. Noting that Argentina would host the IV Global Conference on the Sustained Eradication of Child Labour in November, she said the country also placed an emphasis on education and the creation of decent jobs. The promotion and protection of human rights was another important State policy. Argentina had worked hand-in-hand with its regional neighbours to pursue that goal and it had presented its candidacy for Human Rights Council membership for the period 2019‑2021. Argentina was also implementing its first national action plan against gender discrimination aimed at the protection of women’s rights, she said. As well, an agency focused on developing policy for persons with disabilities had just been created, with an aim to change the “still-distorted view” that persisted for that population. Her country’s fight against drug trafficking was another part of its national agenda, she said, voicing support for the establishment of an international court to address organized crime. Expressing regret over the situation being faced by the people of Venezuela, she recalled that Latin American Heads of State had recently joined together to condemn that country’s break with democracy. “It is with pain that I have to say these words about a kindred country,” she said, calling for credible, good-faith negotiations to peacefully re-establish democracy in Venezuela. Condemning terrorism in all its forms, she reiterated her country’s commitment to bringing to justice all those who had participated in the financing, preparation or carrying out of such attacks. She also called on the international community to support Argentina’s request for Iran’s cooperation on the ongoing investigation into the 1994 attack against the Asociación Mutual Israelita Argentina. Noting that her country would host the next World Trade Organization (WTO) meeting and that it would take up the presidency of the “Group of 20” in 2018, she expressed faith in the multilateral trading system, urging that it be implemented in such a way that reached everyone. Argentina was expanding its profile as a party for investment, initiating a “focused regionalism” with an emphasis on small- and medium-sized enterprises, she said, also outlining the country’s enhanced links with the European Union, Japan, New Zealand and other nations. She also pledged Argentina’s continued support for United Nations peacekeeping operations and emphasized its prioritization of environmental concerns, affirming Argentina’s strong support for the Paris Agreement and urging further progress in the implementation of the United Nations Framework Convention on Climate Change. In addition, she emphasized her country’s sovereignty over the Malvinas*, South Georgia Islands and South Sandwich Islands and the surrounding maritime spaces, expressing hope that the “new phase” in Argentina’s relationship with the United Kingdom would help convince the latter to enter into negotiations and resolve that protracted dispute.